Here at Cut Glass Studio we pride ourselves on producing the finest quality hand crafted stained glass. 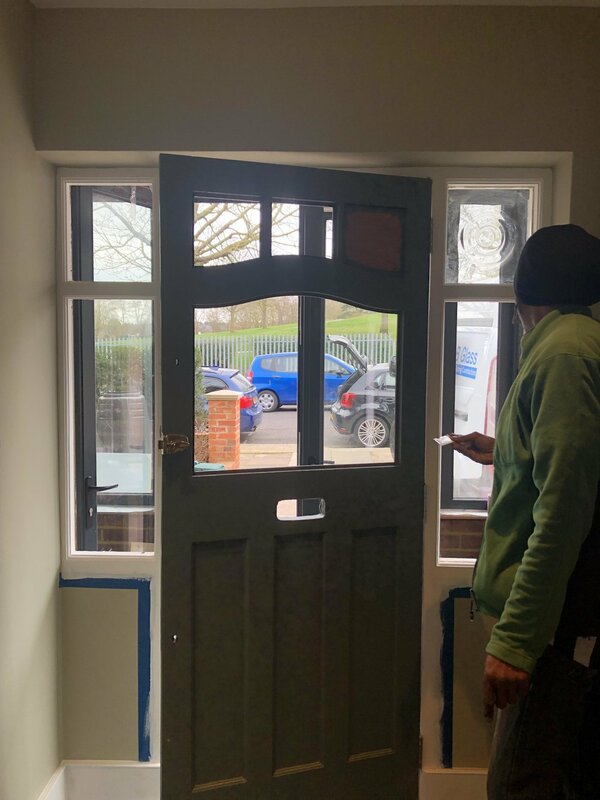 We are often asked to reproduce windows that have been removed or damaged through time as well as producing one off designs to bring life and inspire other areas. Whether it is contemporary, ecclesiastical or period we cover it. Any ideas are welcome; even if you just have a colour or style in mind we will use this to produce a range of ideas for you to choose from. Please use the contact sheet to send us an email and we will get back to you as soon as possible. We have undertaken many different restoration and conservation projects. This is a process that is necessary when a lead light has reached the end of its life. This is usually apparent when the lead light starts bowing, leaking or single panes within start to break or crack. This is normal and easily fixed; the process involves removing the original lead lights and temporary glazing. We then take a rubbing of each panel and approximate measurements to ensure the end result is an exact interpretation of the original window. Paying attention to the details in lead sizes and glass textures/types to recreate areas that may be too damaged to keep. Once all of the information is taken from the original panels we pull them apart disposing of the old lead, then each piece of glass is cleaned and re-leaded. The panels are then cemented, cleaned and polished ready to be re-installed into their original housing. This process usually takes us around two weeks and your restored lead lights will be strong, and looking brand new ready adorn your house for another 50-70 years. It is not always necessary to remove panels to repair areas that may be cracked or damaged. As long as the lead light is not too old and the lead work is not damaged it is possible to replace cracked pieces in situ. This involves us closely matching the existing glass and simply replacing each piece by smashing out the affected area, cleaning out the H section of the lead that houses the glass, open up the lead flange carefully and offer up the replacement glass. Once that glass has been cut accurately we close down the lead flange and putty in the pieces to seal them in. This process does leave some visible damage but is minimal. If you require a consistent finish we advise a full restoration of the lead light so that all lead is replaced and leaves a fresh clean finish. The cost of repairs in situ is £50 for first repair and £25 for any additional repairs. 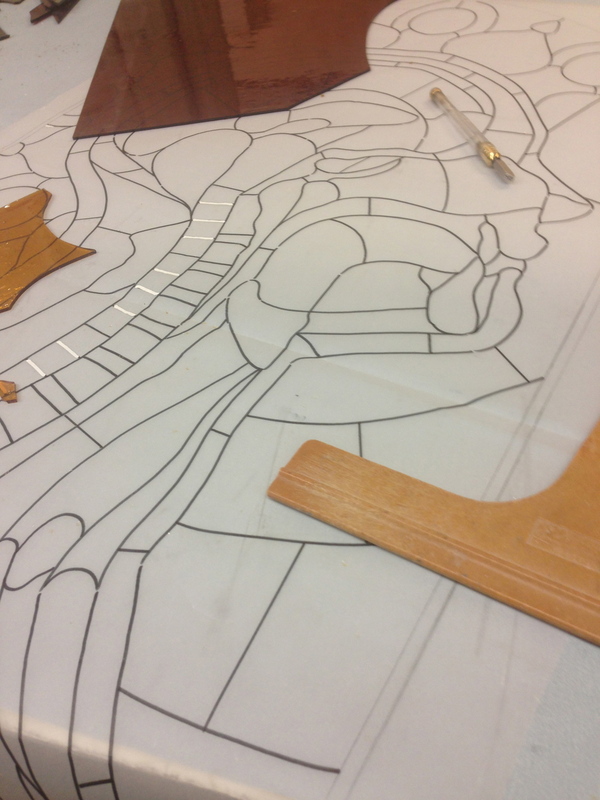 We use many different processes to produce our wide range of stained glass. The most common aspect is kiln fired glass painting. This appears frequently in Edwardian and Victorian glass and of course in ecclesiastical works. We pride ourselves in producing almost exact replicas of aged period lead lights as part of the restoration process. We also use this process to add depth and tone to glass for contemporary pieces alongside sandblasting and acid etching. These processes lend themselves well to adding details to transom panels for house no’s or names and enhancing contemporary pieces. Other processes used include fusing and copper foiling for more detailed pieces. We love a challenge and believe anything is possible. We have undergone many exciting projects interpreting many different peoples ideas for advertising to personal ideas for enhancing ones home. If you would like us to help you realise an idea please send us an email with as much information as possible so we can gather some ideas and get back to you as soon as possible to arrange a visit. We provide a full range of etched repeat patterns, decorative door panels and can reproduce etched panels to any design specification. All etched work is produced on 6.4mm Laminae glass or 4mm Toughened as standard. Please visit our site: www.philipbradburyglass.co.uk for more information. We offer a full fitting service from removing existing lead lights and temporary glazing to installation and secondary glazing. 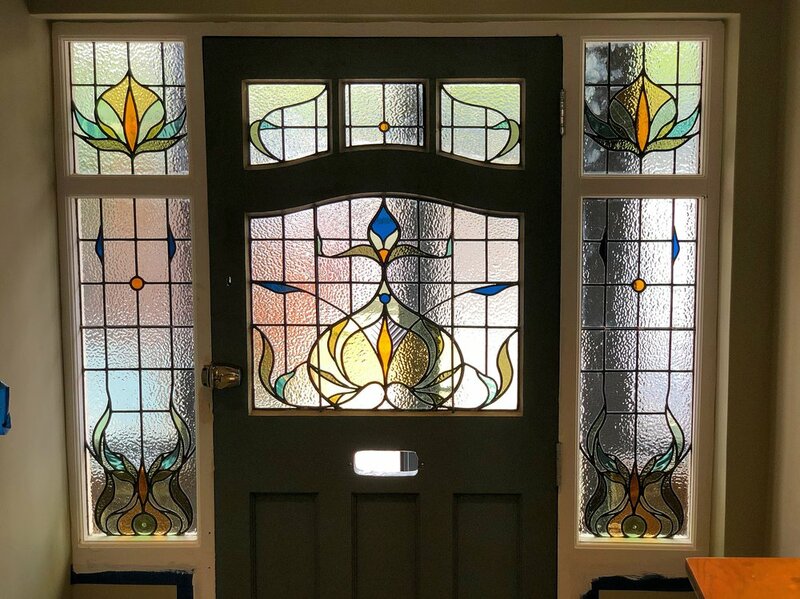 This is usually a separate charge to quotes provided for stained glass works so if you would like to use our service please ask for your tailored quote.